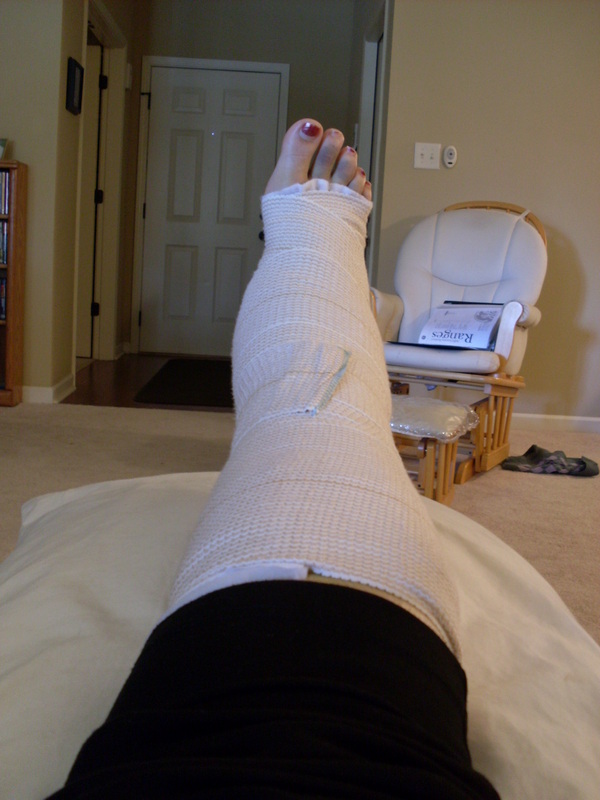 Short version of the story: I fell and dislocated and fractured both bones in my right ankle when leaving the library after spending the afternoon working on The Art of Romance. You can read the long version of the story here. That weekend, my parents came over and picked me up and took me home with them to Hot Springs, Arkansas, where I would stay while I convalesced. 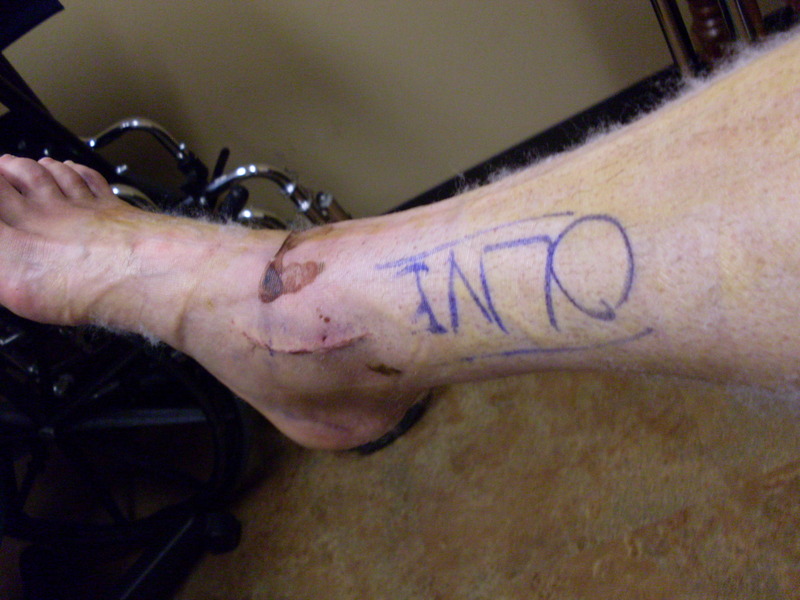 On Wednesday, November 17, 2010, I had surgery to plate and screw the bones back together. You can read about my surgery experience here. 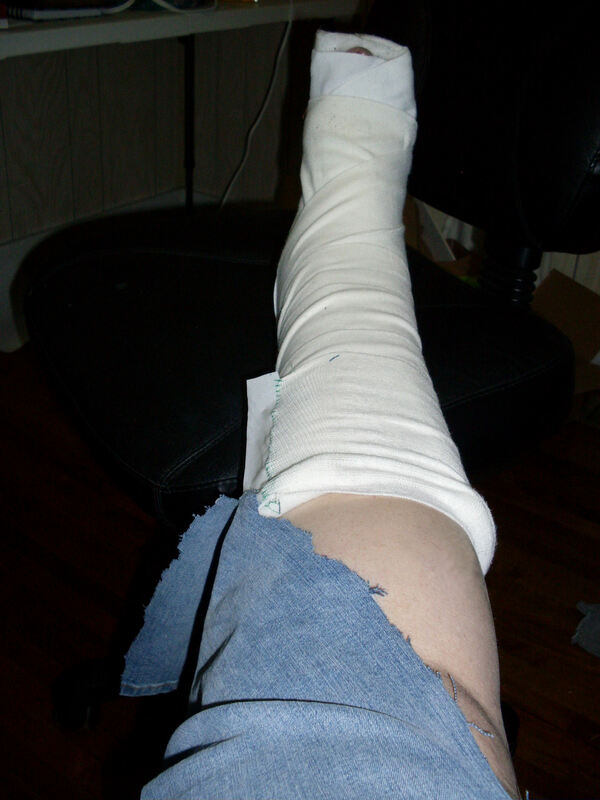 A week after surgery on Wednesday, November 24, 2010, I went back for my first follow-up appointment at which they removed the surgical splint (and the cotton batting, which is what you see stuck to my leg). And, of course, there’s a blog post about that. 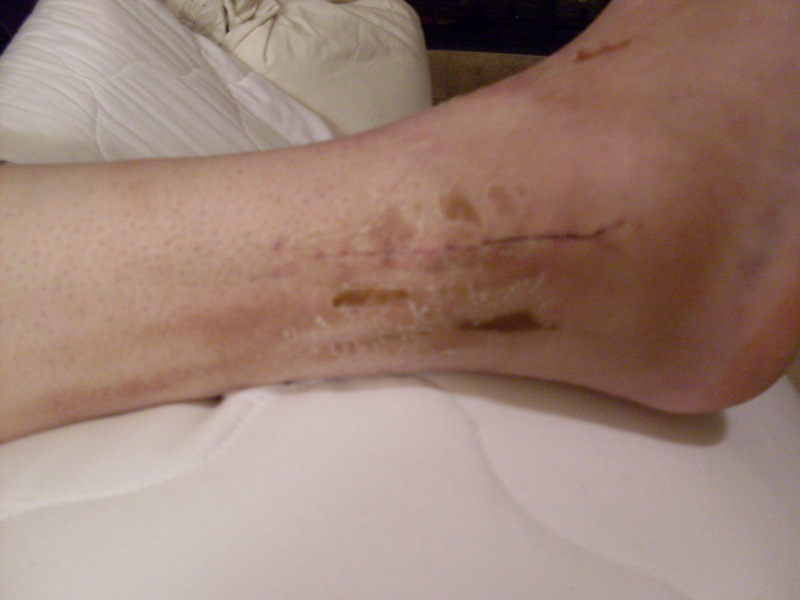 All of the skin abrasions/scabs surrounding the surgical scar are from where the original ER splint rubbed my skin raw. After spending a month getting around in a wheelchair that barely fit through the doors at my parents’ house—and was a (literal) pain for my parents to get in and out of their vehicles whenever we went anywhere—on an acquaintance’s advice, I found a medical supplier in Little Rock that rented knee walkers, so on Wednesday, December 9, 2010, we drove over to Little Rock to get it—and to have lunch with my uncle and aunt who live there. Over Martin Luther King weekend, my mom and I made a trip back to Nashville so that I could participate in the Manchester-Coffee County Library Author Day event on January 15, 2011. Then, the next week, back in Hot Springs, I had another appointment on January 20 at which we set the date for my final surgical procedure and at which I was told I could start driving again—though I still had to walk in the boot—which meant a change of footwear getting in and out of the car. 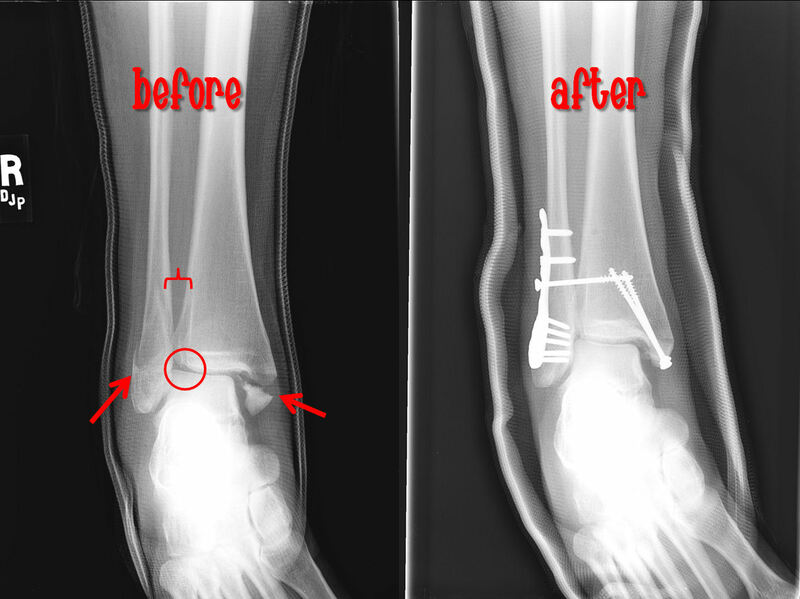 On Wednesday, February 2, 2011, I had a quick in-and-out surgery to remove the long screw that corrected the separation between the fibula and tibia. Once this surgery was complete, I was free to go—back home to Nashville! I did have to go back to Hot Springs once more for a final appointment on February 17, 2011, at which I was given the all-clear to continue recovery on my own. It’s been a long road of recovery, and I’m still working on it. 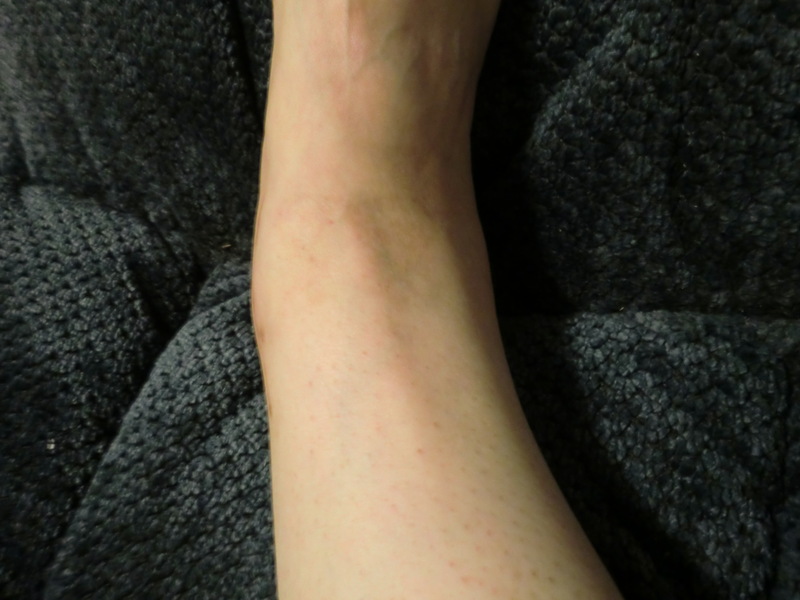 Because there was so much soft tissue damage due to the dislocation, I still have problems with pain and stiffness, especially if I’ve been sitting for too long (and given the nature of my jobs, it’s pretty much a given that I sit too long all the time), but it’s coming along. So, there it is. 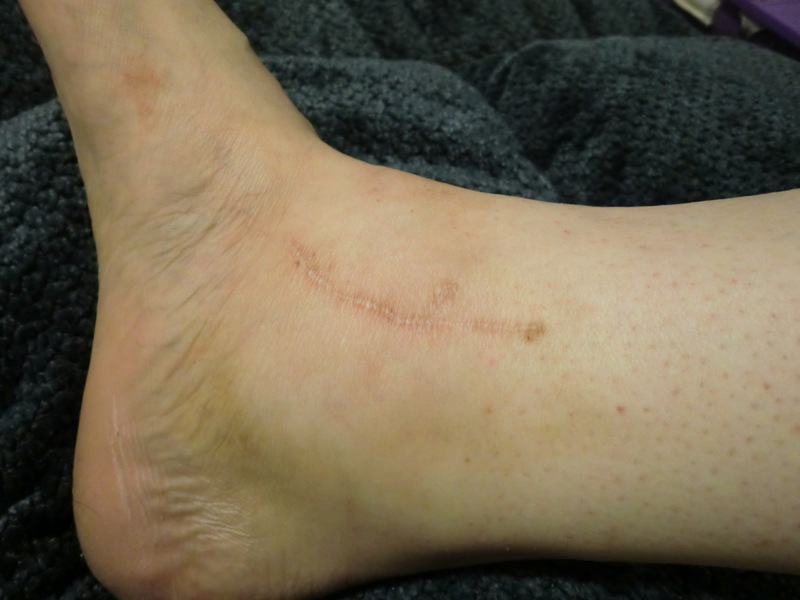 A “year in the life” of my ankle. Oh goodness, what a long year. I’m so lucky that even with owning and riding horses for 30+ years, I’ve never broken a bone. 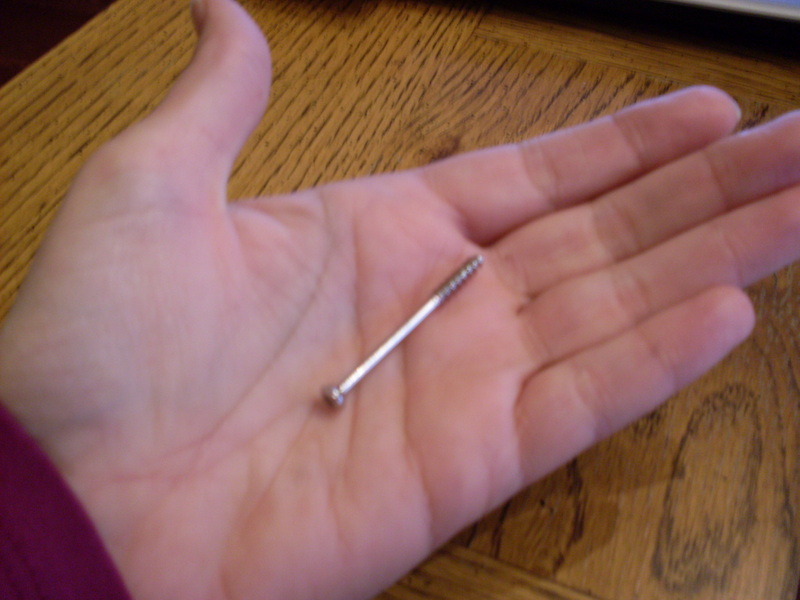 And that screw looked huge! It was a pretty long screw—of course, it had to pull the fibula and tibia back together, so it had to be long enough to go almost all the way through both. The danger in that situation would have been if they’d let me start walking on it too soon and that screw had broken at the point between the bones. That would have meant massive surgery to remove it and who knows how long of a recovery. 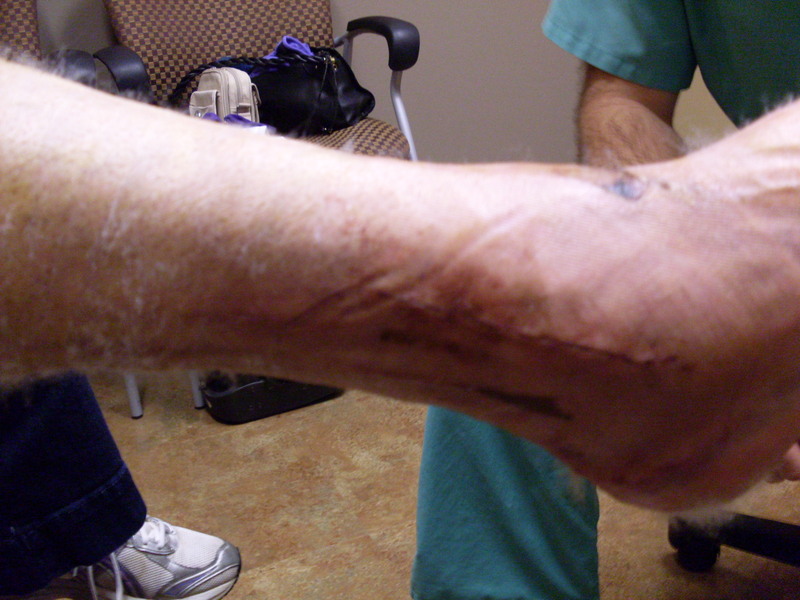 Every time I hear of someone having complications with their broken ankles/surgeries, I thank God for sending me to a great surgeon with a fabulous PA who was overly cautious with me so that there were no complications. Sure, I got frustrated at hearing “three more weeks” at a couple of appointments (staying off the foot, staying in the boot), but in the end, it was worth the extra time to ensure there were no problems. Glad its doing so much better it did look ouch. does the cold weather affect it at all. 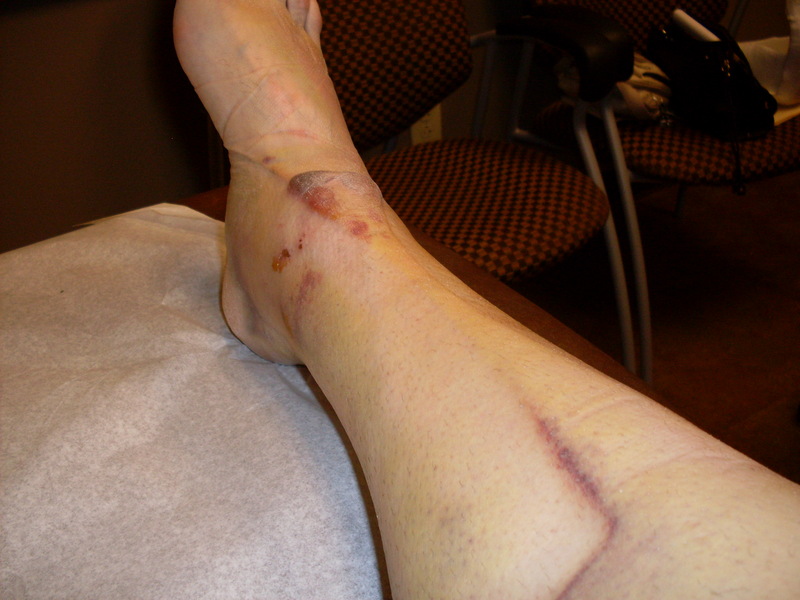 My mum broke her leg 3 years ago above the knee it was a spiral fracture and had a rod and screws keeping it together. Cos of her age they will never remove them. What an ordeal! So glad your ankle is doing better Kaye! Thanks, Victoria! It’s hard to believe how much longer it’s taken me to recover from this injury than it did to recover from back surgery (though I lived with the ruptured disc in my lower back for over a year before surgery as we eliminated all other possible treatment options)—but I guess that recovery seemed much faster because what came before the surgery was long and extremely debilitating. 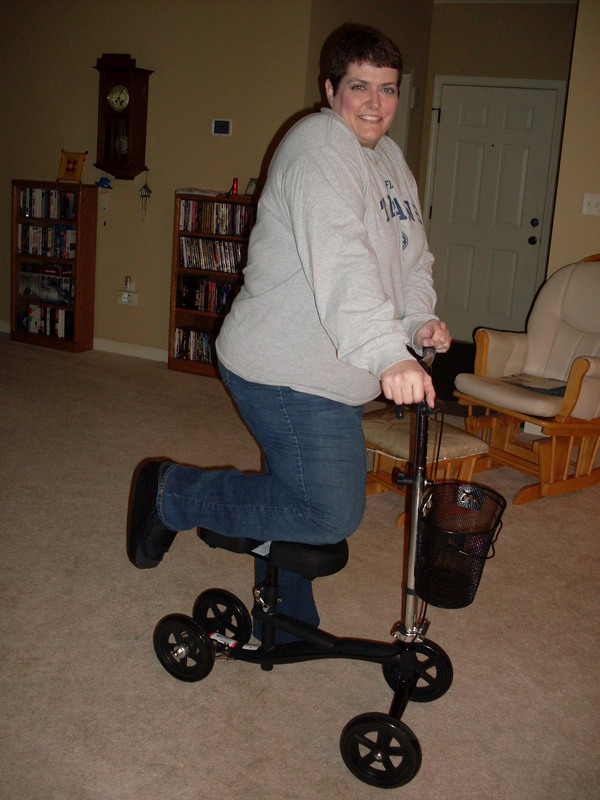 But as I recall (that surgery was in 2003), it only took a month or two to feel “normal” again, though I still had to take it easy and not bend/lift too much. However, for the most part, the pain was gone after a couple of weeks in that case. That knee walker is cool! I’ve never seen one before. I guess there’s a tool for everything, huh? it’s awful how some injuries just stay with you. I know lots of people have trouble with old breaks forever – feeling it when the weather changes and so on, but the lasting effects of soft tissue damage are something many people don’t think about. My mom sprained her ankle walking down the stairs a couple years ago and it took longer to heal than a simple break would have. 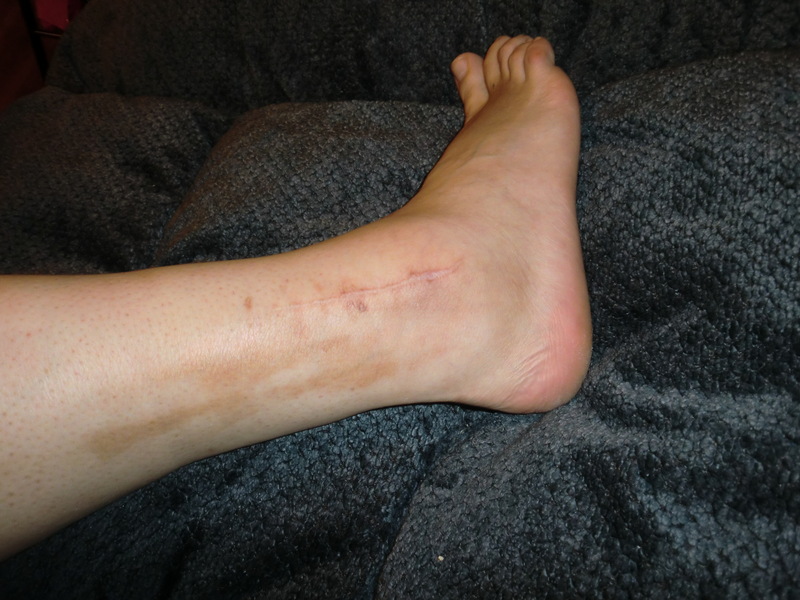 If, at some point, you find yourself in a place where you can afford a few treatments, Active Release Techniques (usually shortened to ART) can be very helpful in breaking down scar tissue and adhesions in the muscles and connective tissues to eliminate some of that pain and stiffness. Actually, it’s hard to believe it’s already been a year. I guess because I figured I’d be much further along with recovery a year later. I know if I’d get back to the gym, as I’ve been saying for months I’ve wanted to do, the recovery would be/have been a lot faster. I also can’t believe its been a year ago because I thought it happened right before Christmas. I’m glad you are doing so much better! I’m so glad you’re mobile again!! What an ordeal you went through. I was just thinking about that the other day. So, tell us, any great lessons learned during that experience that you’d like to share? (c) I have the best parents in the whole wide world! And we, her parents, learned a few things, too. (a) our house is almost as handicapped accessible as we would like it to be (except for door frames). (b) keep the car gassed up at all times. ACK! why won’t it let me edit so I can put in that missed comma! 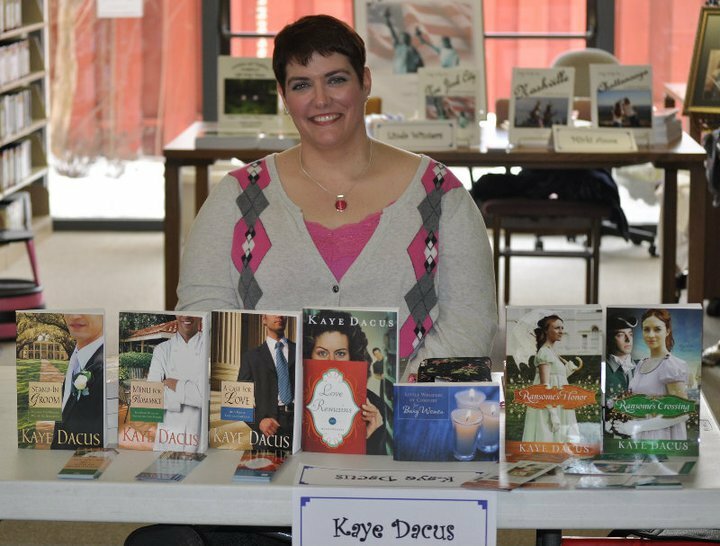 I’m so glad you’ve had a good recovery, Kaye! The knee walker is very neat. I’ll have to remember those if, heaven forbid, I break my ankle again. I know exactly what you mean about the stiffness and soreness, I have the same problems with mine. Of course mine’s been broken three times, what can I say I’m really talented when it comes to breaking my ankle. 😉 As you can tell I can laugh about it now. BTW, the last time I broke mine, I stepped off a curb going to the passenger side of my car. That’s something I will never do now, and if I have to step off a curb in a parking lot, I often put my hand on the hood of my car as I step. SO glad it is this year and not last year… for both of us. 🙂 That ankle is looking a whole lot less scary.